I’m excited for my first post on the Rogue Women Writers blog! I write my own Emma Caldridge series as well as Robert Ludlum’s Covert One series. Both of these series give me ample opportunity to write about some of the most interesting geopolitical and biological issues facing us today. Emma is a bio chemist that travels the world searching for plants and other things that have an application in cosmetics or medicine. Think “MacGyver meets chemistry” and that’s Emma Caldridge. Over the course of the four books in the series she has also been tapped by a government military contractor to handle undercover assignments in hot spots the world over. · On certain islands there are trees that drip acid sap? The Manchineel tree, with its yellow “death apples” (called beach apples by the locals) will burn you with its sap and kill you with its fruit. Don’t stand under one in the rain and never eat the fruit. · In Colombia the FARC, a paramilitary group, once downed a plane on a highway and kidnapped a Senator? As KJ Howe wrote in an earlier post, kidnapping is BIG business in a lot of sketchy nations. · That the common Salvia plant can cause psychedelic hallucinations? · That bulletproof glass can be shattered, and if the attacker fires three shots in a tight triangular pattern it can shatter quicker? I love writing thrillers and I love the research involved almost as much. I try to weave actual facts in with the fiction and end each book with an author’s note to let the reader know what is real and what is not. I’m halfway through the next Emma Caldridge manuscript now and when it launches in May, 2017 you can bet I’ll have added a new and fascinating fact to the above list. As we continue with this blog I’ll try to give a glimpse into the world of writing and researching thrillers. And if you have your own story about an exotic location or strange occurrence you’ve encountered, I’d love to hear about it! 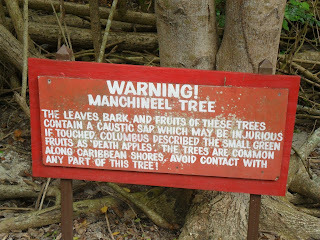 Jamie, I didn't know about the Manchineel tree OR the shortcut to shattering bullet-proof glass! I loved Running From the Devil and can't wait to read the next Emma Cauldridge in your series! Thanks Sonja! The next is set in Africa and several of those countries are reeling with the influx of terrorism. It's a fascinating part of the world. Wow. This is what makes reading thrillers so exciting. I can't wait for your next one, Jamie. Wow - what interesting research! Your stories are truly fascinating -- it is great fun to read a novel, like yours, where I not only have a "good time" enjoying the characters and their challenges, but also learning so much about these exotic locales. (I think I'd better check with you before booking any "unique" travel). Thanks for all the new info. I love the Facts -- all things I didn't know! I learned a fun fact about plants recently. My younger brothers (who are much younger than I) are really into Zombies. We came up with this crazy idea to market Zombie air fresheners for cars that should be used only in the event of attack. I made prototypes out of gray foam and colored them, but what to use for a scent. Turns out the Carrion flower, native to Sumatra, grows for 3 to 10 years and then only blooms and smells for 24 to 36 hours. What a fascinating blog. With trees like that, who needs human villains! Thanks so much for expanding my world, Jamie! Okay, do you have to eat the salvia or smoke it, Jamie? LOL. Thanks for a creepy and enlightening post! Jamie, love those fascinating facts. That's a big part of the joy I experience when researching thrillers. Do you have any bio-chemistry background or did you research everything for Emma? I spent years as a lawyer working on Food Drug and Medical devices, and loved the research for that as well. As for Emma, I have to do a lot of research to find the unusual, because she is always someplace different (and dangerous). Glad you liked the facts! And Francine-you should smoke it! I'm loving the new Rogue Women Writers blog! Finding unusual facts during research is a lot of fun, although I often get trapped in the surfing cycle on the web. With so much information at our fingertips, it's hard to resist.